This Luminite crystal comes cast as a 1/2″ wide and 5″ long double terminated crystal. It has multiple quartz crystals inside of it. 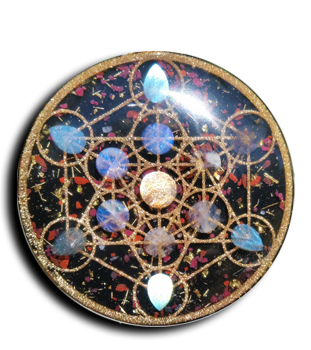 Luminite is a small handheld orgone that uses only metallic glow powder, quartz and resin in its construction. Because it is encased in a concentrated solution of glow powder, it shines incredibly bright in the dark and glows even in daylight. Honestly it can be quite startling when you see how this little crystal can light up a whole room in the dark (when it has been charged up for a minute). Luminite will glow in the dark all night long, even with minimal exposure to light. Luminite will charge best in UV light (UV flashlights or lasers are great to have because they can fully charge up the luminite in mere seconds). Incandescent and florescent light works well too. Black light is too weak to effect the metal inside the luminite. Be sure to check out our different colors, and shapes.